It’s Webby time again, and FactCheck.org is up for best Political Blog/Website. The annual awards competition recognizes “the best of the Internet.” It’s the 19th year that the International Academy of Digital Arts and Sciences is awarding prizes. 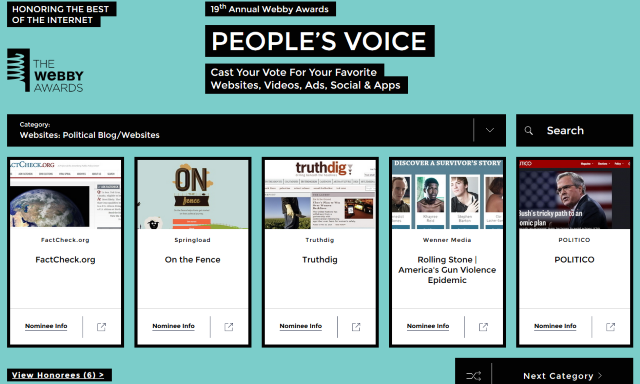 Last year, we won both the Webby Award, voted on by a judging panel, and the Webby People’s Voice Award, which is determined by a public vote. We hope for a repeat. You can help us win another trophy this year by voting for us in the Political Blog/Websites category. Use your email address to sign up and vote, or vote using your Twitter, Facebook or Google Plus account. Voting ends on April 23 at 11:59 p.m. PST. And if all goes well, we’ll have more good news to report when winners are announced on April 27. But no matter what happens, we thank you for your support.